This week I’m sharing links to two necklaces that I’ve bought and worn comfortably; Dogeared Balance & Karma necklaces. In 2012, I was unfortunately involved in a severe accident which left me managing leg casts for several years. During rehabilitation, I came across the Dogeared necklaces. 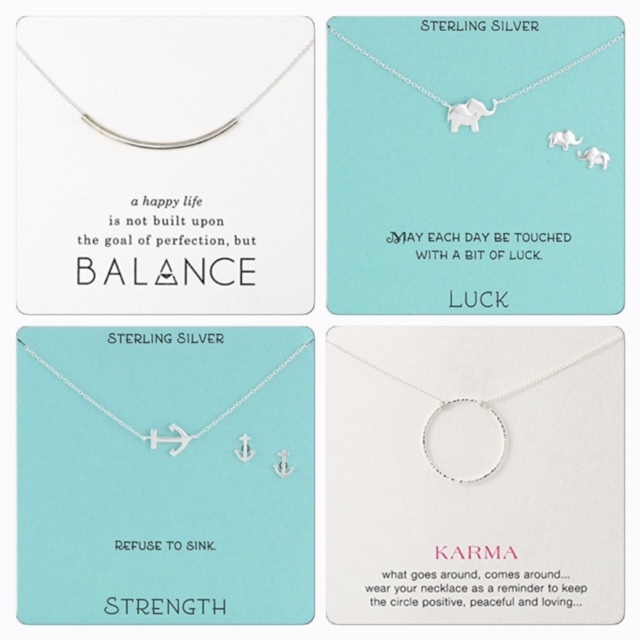 Dogeared has several inspirational symbolic necklaces to choose from, pictured are: Luck, Strength, Balance and Karma. I find that balance above all else is key for me. Maintaining physical, mental, emotional and spiritual balance is a daily consideration for me and certainly not easy to manage consistently. I found that having these necklaces as reminders has helped with my consistency in managing day to day tasks, with or without injuries, during and after rehabilitation. Feel free to browse the links to see if any of their expressions suit you. Happy adventuring Lovelies! !